Zombies networking might have been the first impression of the unsuspecting visitor to the Hills Road Clydesdale bank meeting room last night. But no, the hideous gurning figures greeting each other were actually breaking the tension at Aaron Garner's presentation to the JCI Cambridge, "People watching, what are you missing?". For Aaron is a certified FACS coder, someone who analyses facial expressions to determine what people are really feeling when in conversation. 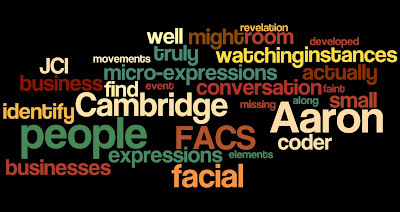 FACS stands for Facial Action Coding System, a system developed by decades of research by Ekman and colleagues and actually had its origins with no less than Charles Darwin's "Expression of Emotion in Man and Animals". Tension relieved, Aaron had us working in small groups to find out what the key facial elements were for seven emotions. Flashes of happiness, sneers of contempt, jaw dropping surprise, nose wrinkling disgust, wide eyed fear, pouting sadness and teeth clenching anger rippled across the faces around the room ; Oh to have had the video camera there! Our new found knowledge was then put to the test to see if we could identify micro-expressions, those very faint involuntary movements that reveal if there is a conflict between the verbal message and the thoughts behind it. It was a revelation and a relief to find that we could in most instances identify little "tells". What we might have perceived as a gut reaction in a conversation could now be seen as based on these facial micro-expressions as well as other factors such as body language and changes in overall speaking style. In the vast majority of instances, we are people with a set of beliefs and empathies that are reflected in our expressions, whether micro or macro. The exceptions are those who truly have no empathy and moral framework, such as psychopaths! But how is this relevant to business? The reality is, that with the increase in technological options, the people we meet and deal with remain incredibly important. For many of us in small businesses, we ARE the business. By taking a conscious approach to our people watching in meetings with businesses, clients and partners, we can improve our communication, identifying hidden problems early as well as recognising the positive aspects of our relationships. This was truly an eye-opening event, in more ways than one! If you get the opportunity to attend a talk by a FACS coder such as Aaron, I thoroughly recommend going along. Also look out for the JCI Cambridge which has risen like a phoenix and is providing interesting and cost effective events in the Cambridge Area. Thank you for the great summary of the evening Chris. I had a great night with a great group of people. It amazes me that within 1 hour of seeing this blog myself, a fellow FACS Coder contacted me from the US to say they had read it also. How your word travels! Thanks again.